How You Should Sleep to Relieve Neck or Shoulder Pain? Are you unable to sleep, tossing and turning all night due to discomfort and pain in your neck and shoulder? This occurs due to various reasons such as Tendon inflammation, wrong position, Instability, wrong pillow, Arthritis, injury, and Bone Fracture. This kind of pain is really common among the people after a day full of a hard shift, spending sleepless night. The researcher found wrong sleeping position twisting the neck & shoulder in an uncomfortable position that is out of the alignment. Therefore, it’s very essential to invest time to know the problem and find out a therapeutic solution to relieve the pain in your neck and shoulder. When you sleep, you need a supportive pillow that supports your sleeping position and the natural curvature of your neck and shoulder. The pillow must be neither too high nor too low. If the pillow is too high, your neck muscles are strained badly and hamper your breathing flow. On the other hand, a low pillow is also risky if it’s not properly matched with the sleeping position. • Back Sleepers: If you are sleeping on your back, pillow with thin loft is suitable for you. Back position is ideal for the neck and shoulder support and comfort. This position perfectly aligns the spine alignment with the neck curvature in a comfortable posture to sleep. • Side Sleepers: For the side sleeper, a slightly thicker pillow is required for ample support. In fact, the side position is the most recommended sleeping position as it properly aligns the structure in a neutral posture. The pillow should neither be too high nor too low. Too high pillow leans the neck and shoulder in a painful position and too low pillow twist the curvature out of the alignment. • Stomach Sleepers: Stomach position is the least suggest memory foam pillow since it puts stress on the neck and shoulder muscles and leads to severe pain. If you are a habitual stomach sleeper and can’t leave suddenly, then try sleeping on a thin pillow to best support and comfort. Place a knee pillow between the legs to avail complete comfort and relaxation. Either sleep on your side position or back position which provides ultimate support to neck and shoulders. This also helps relieve the sleep issues such as neck pain, cervical pain, shoulder pain, insomnia etc. 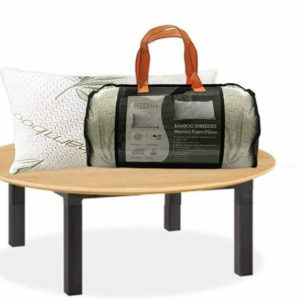 Place the bottom pillow supporting the shoulders and the top memory foam pillow supporting the neck. Use tender deep breathing when lying down first. Try using Contour Memory foam pillow with infused gel to enhance the air circulation to your muscles. If your shoulder or neck pain stays for more than three days, then you must consult an orthopedic doctor. Back and side sleeper gets relaxation from keeping a small roll-shaped pillow beneath the neck for extra support. You can also simply rolled-up towel placed under the neck for utmost comfort. Neck and shoulder pain is common among all age group of people which also leads to end number of other sleep issue and many sleepless nights. 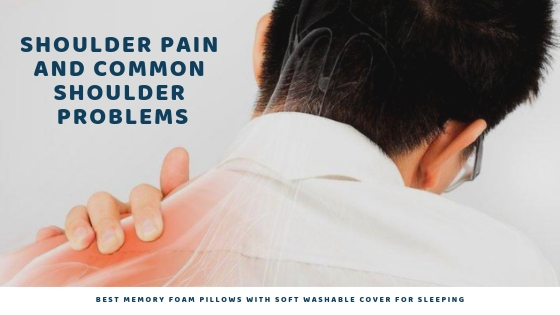 The orthopedic pillow that matches with the sleeping position is helpful for neck pain and shoulder pain relief. Sleepsia is a reliable brand delivering top-quality memory foam pillow across the USA. The delivery process is customer-friendly & hassle-free with proper details of each product given. To purchase Sleepsia product, simply visit the official website www.sleepsia.co, identify your choice and place an order for the best pillow that suits you or call at 1800-862-1084 in case of any doubts or queries. ← Shoulder Pain: 3 Most Common Causes and How to Fix it? Sleepsia Ventilated Memory Foam Contour Pillow: Boost Better Breathability! Could That Shoulder Pain Really Stem From the Neck?